Sometimes you just need to decide, as a group, where to stop for a 10-100 or a crunchy bean & cheese burrito. It�s amazing how enjoyable a group ride can be when you�re all on the same page! And with a plethora of communication options at our disposal, it�s hard to make the right choice. Many are familiar with the terrific-yet-spendy radio-based Chatterbox communication system. It�s a terrific long-range and expandable solution if you and your friends have the cash to buy into the kit which can run upward of $700 for a pair of high-end units. Lesser expensive solutions for rider-to-passenger and bike-to-bike communication have cropped up in the last few years based on the popular Bluetooth technology. 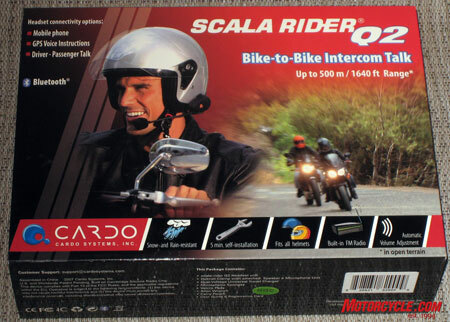 Enter the function-packed Cardo Scala Rider Q2 system (MSRP $219.99). You might be familiar with the Cardo name from inner-office comm devices or cellular phone accessories such as hands-free headsets. This is basically the same type of cell-phone product, but redesigned to fit into a motorcyclist�s helmet; either full-face or open. Cardo Systems is a big player in headsets for mobile phones, and the Scala line represents Cardo�s Bluetooth telephone products. The Rider series is its motorcycle-specific product, and the Q2 refers to the latest version of the product which now includes the Bluetooth 2.0 range connectivity. The small and unobtrusive fully weather-protected unit mounts to your helmet � with a choice of three mounts � and can be installed in minutes. Each of the two speakers and the microphone are hard-wired to the device�s helmet clamp which mounts outside your helmet shell. The communications unit then snaps into the clamp. The communicator pops off easily (but securely) so that it can be hidden from potential thieves. Additional helmet clamps can be had for $30, sparing you the hassle of rewiring the kit when choosing between multiple helmets. As is standard practice with any Bluetooth device you intend to communicate with, each unit needs to be �paired� to another before you can start correcting the lead rider, I mean, conversing with a fellow riders� Q2. A simple task even EIC Kevin Duke managed to do with aid of the manual and a few minutes time. The Q2 system is capable of pairing to up to three devices, which will �speak� to you in singular priority. Pair up your cell phone, GPS navigation device as well as a passenger or fellow rider, and incoming transmissions will clearly connect and never overlap, each making way for the other in accordance to the Bluetooth priorities stack built into the brains of the Q2 unit. Not only can you clearly hold conference calls at 50 miles per hour, the Q2 allows you to tune out the world and tune into your favorite radio station with its built-in FM receiver. Jamming out to the Strokes while riding your local twisted roads is sure to keep you in the zone longer. When incoming phone calls or communiqu� from your pals come in, the FM radio automatically mutes and returns after transmission. Very slick, and all without taking you�re hands off the bars! Cardo�s AGC Technology automatically adjusts the volume of the unit according to wind noise so you don�t blow out your eardrum when you stop at the traffic light after a raucous jam. It�s subtle but somehow works very nicely. Cardo boasts a 1,640-foot range under ideal circumstances. That may be true in Nebraska, but not in the hills of Malibu. Still, the range of the communicators was often impressive when the two units were in sight of each other. They effectively keep two riders in full duplex contact (talk and listen simultaneously) with each other during both city and highway travel. In addition to connecting two riders, the Q2s will also connect a rider and passenger. 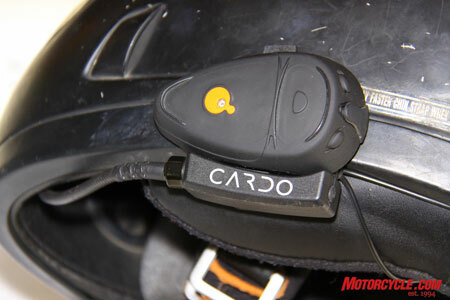 Cardo claims the rechargeable unit has the capacity of eight hours of talk time and one full week of standby charge. We rode from L.A. to Laguna with these units, listening to both the radio and each other singing to ourselves without wearing them out on the full day of riding. If you and your riding buddy want to save a few bucks, you have the option of ordering a two-pack system called the Rider Q2 Multiset. Its $395.99 MSRP includes factory pairing as well as MP3 player input ability not found on our singular units. One of our few gripes about this inexpensive and robust device is the amount of pressure necessary to change radio stations. My finger got sore scouring the radio frequencies when trying to find my favorite tunes. It should also be noted that continual Bluetooth connectivity to a cell phone will drain the phone's battery quicker. After using the Scala Rider Q2s for a few months, we appreciated being able to share thoughts and important info without resorting to pantomime arm gestures. Not only that, but understanding each other without screaming into the chin bar of our helmets over road and wind noise is priceless. Visit http://www.cardowireless.com/ for more information. kekekkee......aku dah gak dah ...mesti ko org yg pertama akan reply benda nih dulu......price x check lagi......coz still new brand dlm market....so far spec dia mmg baguih kan......hahaha. * Designed and Engineered for Heavy-Duty Performance. * Receive , initiate and reject calls by voice control (subject to mobile phone capabilities). * Two-way radio between rider and passenger (INTERCOM / Rider-to-Passenger communication). * Weather protected headset fits open-faced and full helmets. * Self-installation of entire system within 5 minutes, leaving no traces on helmet. * AGC Technology automatically self-adjusts speaker volume according to ambient noise level and driving speed. * VOX Technology provides voice-controlled receiving and rejecting of incoming calls. * Special clamp allows attachment & release of the headset within seconds. * Up to 7 hrs. talk time / 1 week standby (recharging from regular outlet). bg aku, utk lebih efisyen hanyalah kdn call masa tgh ride.. itu je..
masa lain aku tak pikir sgt..
tp rege masih lebih murah sikit dr nolan punya comm device.. Item price: 229.95 EUR bro Dark dah bagi tuh..
kalu convert RM.. ahak x 6 jerk..